This quilt I had sewn several years back with the hopes to have it ready for a little one. I had come close to giving it away a couple of times but just didn't have the heart to part with it (glad I didn't). I made the banner using muslin and calico fabrics and was a last minute project for my shower and later for the nursery. Although I loved this idea of a ruffled bedskirt, I really didn't want to spend too much time on this sewing project, so I found a printed fabric and cut and sewed on rectangular sheets; I added a crochet edging to finish the bedskirt. I really love whimsical prints and had collected some over the years, but hadn't found a place for them. Finally they have a home! Woodland creature prints from papersparrow, daisy painting made by my bf, woodblock prints by danita art, embroidery made by me using Cathy Gaubert pattern, and Red Fox by berkley illustration. Love this little shelf, it showcases another painting made especially by my bf for our little girl, my bf's beloved knitted bunny from his childhood, the decorative letter I made, and the garland I crocheted using the rosettes from my shower. One last thing, the picture book Extra Yarn is pretty amazing. I fell in love with the story and the illustrations are really adorable. During my summer vacation, I've been slowly working on some handmade decor for the baby's room. I really wanted to make a decorative letter for her room and as always Pinterest is a great resource. I decided to give it a weathered look and used what I had in my stash. Here's how I made mine: 1) I first painted a base coat of wicker white (2 coats) and then hand-stamped "Homemade with Love" with black ink over the dried base coat. 2) Once the stamping is completely dry, I brushed a heavy layer of crackle medium over the letter (let it dry 'til it has a tacky consistency). 3) I evenly painted one top coat* of Martha Stewart's "Beach Glass" (love this color!). * Note: do not re-paint or try to go over certain areas, you'll end up smudging the crackle medium and undoing the crackling effect. 4) For the border of the letter I inversed the colors - Beach Glass base coat, crackle layer, white top coat 5) To help prevent chipping and yellowing, I sealed the paint using Liquidex Satin Varnish (3 thin coats). On the inside of the "P" I cut and glued a strip of pink gingham fabric as a contrasting accent to the seafoam color. I also recycled a crochet rosette I had leftover from my baby shower (I had made them as brooches for my guests). I'm so happy with the result, the crackling effect came out great . . .
My all-time favorite holiday has been Halloween. Forget Christmas, if I could have Halloween repeat itself on December 25th, I'd do it (sorry Santa). Of course when I was younger, it was all about the costumes and dressing up. Now, at least for me, it's shifted to the decorations. The whole concept of turning your home dark and dreary can be really fun. 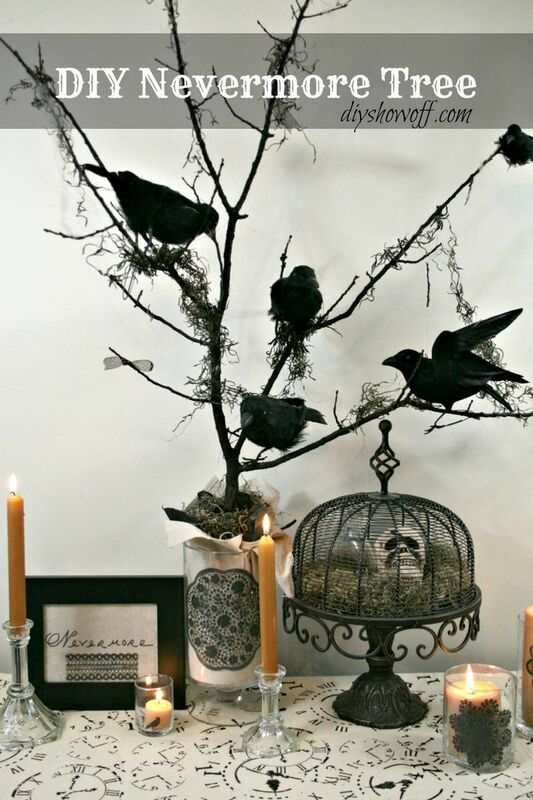 The amount of inspiring ideas are overwhelming on-line, but here are some of my favorite DIY halloween decor. this DIY ghost wreath is adorable! These Halloween Luminaries are easy to make and look great! This Poe-inspired tree is pretty cool! These broomstick lollipop favors are great for trick or treaters, or if you're a teacher like me, as favors for your students! I'm definitely making this spooky bat chandelier; it's incredible! I've accumulated a lot diys on my Pinterest boards and thought that as I try out some of the projects, I could also provide some insight on how well the diy came out here. Whenever I work on a diy, I've noticed that there are always things I'd want to do differently the next time around. There are many Paint Chip Coasters diys circulating the internet, but the crafty cpa has a very easy to follow tutorial. Here are some notes I jotted down . . I made a big mistake by not allowing the acrylic spray to dry completely, so one of my tiles has a round indentation on its surface from the glass I propped on it. Note to self: diys are more successful when you're patient! Another thing I noticed is that the acrylic coating does crack once it dries, so it's important to add several coats so your coasters can withstand the perspiration from your glasses. PS. the cracks will show even after several coats, so just roll with the punches! One more thing to consider, the lighter the paint chip color the more debris and stains show up on its surface, so you may want to consider picking darker hues for this project. Earlier this week I was organizing my craft room and came across my overstuffed bag of fabric scraps. I was surprised to see how much scraps had accumulated. It was clear I had to find a way to make use of them, so I decided to make an apron. The anatomy of an apron is very basic. You have a skirt, a waistband, and straps, and if you keep it simple by cutting rectangular pieces of fabric, its construction is quick and easy. Now the waistband was made from joining my scraps into a quilt-like pattern. The straps were made from some leftover raw muslin (looks like linen) I had in my stash. For the skirt I used a tea towel folded over a quarter of the section. These tea towels you can find at any Target or Walmart (a 5 pack for $5). They're oversized, so I usually cut them in half to make smaller tea towels, but for this project the original size was perfect. I used this tutorial to crochet my trim and made bias tape using more scraps. I was pleasantly surprised with the end result. I'm not sure whether to gift it or keep it for myself (I'm leaning more to the latter), either way I'm sure it'll get plenty of use. Want to learn great techniques on apron making? Try the book A Is for Apron . It has an endless amount of ideas and easy instructions to follow. Today I took a look at my craft room and felt a bit saddened by two things: 1- I have yet to decorate it and 2- it's a total mess (there's a glimpse of the disorder in the above pic). So, I did a bit of organizing and inventoried my granny squares for my next blanket project - 30 squares so far (yay!) and about 50 more to go (boo!). I used the same wool yarn from KnitPicks which I really love! I've become kind of obsessed with collecting text stamps. The ones in the pic are just a taste of what I've gathered in the past couple of months. 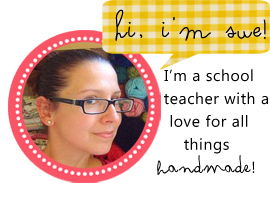 I've been using them to personalize mailing packages, gifts, and school projects among other things. Part of the appeal has been that most of my stamps have come from Studio g. They have a great assortment and are super cheap (just a buck!). You can find them in either at Michaels or Joann. My buttons were everywhere - in jars, drawers, plastic cups (don't ask). I swung by the Container Store and stocked up on some acrylic compartment boxes. What a difference! Now they're all in one place and color-coded. I also finally got around to organizing my batch of new brooches. They're all stamped, packaged and ready to ship out! These are some lovelies I plucked from Flickr land! 1. working energetically and devotedly; hard-working; diligent: an industrious person. When I first made this resolution at the beginning of the year, I almost changed it because it sounded too general, but I realized that "industrious" was a quality I felt I lacked in 2012. After reading the definition, it jolted me - I need to devote my time consistently to being creative . . . and that's what I've been doing during the evenings and weekends. This weekend, I've been experimenting with color and texture on my new set of brooches. At 1st, I was a bit hesitant on how to approach the design. I thought about artists like Pollock, Dali, and Mondrian and that got me inspired. So once I let loose and got messy, I was happy with the results. Lots of splatters, globs of paint and geometric designs seem to be the theme with tons of gold, red, prussian blue, turquoise, and lime color combos. I'm currently glazing them and attaching the brooch pins. Can't wait to post them in my shop! My New Set of Rags! They're done! Well, they've been done since my last show and these were the gals that returned home with me. 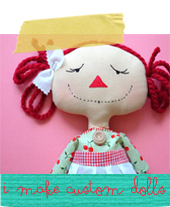 This time around, I really loved how the fabric schemes came out for each doll - really girly and most importantly CUTE! Now let's meet the girls shall we? I have some more patterns that I'll be working on this coming month; I'll keep you posted on the progress! It's progress . . . slow but still progress. Sometime I wish I could magically assemble my doll parts in one day. Once I do get over that hump of the process though, it becomes more fun because I get to focus on forming the dolls' personalities through their smiles, hair color, dresses, etc. Can't wait to finish them up! A quick note: all images and words are mine unless otherwise noted. Any external images used are linked to their appropriate sources. Any images used from this blog, must be given credit back to my site. Only one image may be re-posted or pinned from any given blog post. In other words, image use from this blog is limited to one per external post. Text can not be copied, unless given prior permission by me, the author. DIYS may be shared but are for personal use only. This is a for-profit blog where some posts will share my affiliates or my business. Please note that I only share products that I love and 100% believe in! Therefore, the opinions expressed are solely my own. Copyright 2010-2013 Sue May Ardila. All rights reserved.